September's update includes some unusual and interesting additions. Usually on these pages we tend to feature marquetry and wood inlay pieces made by Buchschmid and Gretaux, but, as you are probably more than aware, there were many more similar producers of such items. You will see some examples of those other pieces on this page. 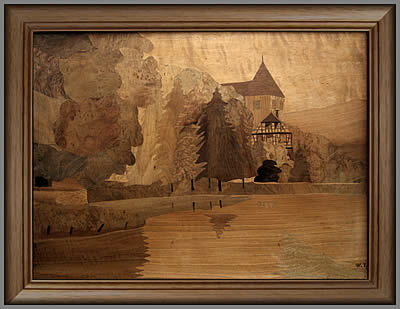 The marquetry picture lower down on this page displays what may have been a "one off" made by a German artist/craftsman in or around the 1930/40's. Do take a look and see what you think, or perhaps know, about it. In John's picture you can clearly see that the background veneer is indeed a book matched pair - so, that's that question solved, thanks John. John purchased his "Rosenkorb" at an Art Shop in Rhein-Main near Frankfurt in the 1980's and he and his wife consider it one of the best purchases they have ever made. 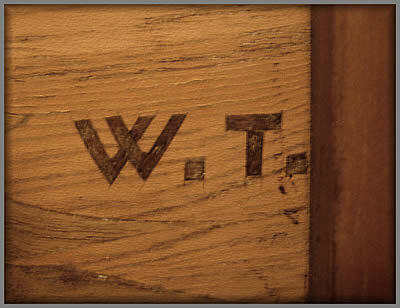 We have to say that we can quite understand that sentiment, it is a beautifully produced example of wood inlay art. These next two pictures you see in our September update are signed with the maker's name of "Spindler". 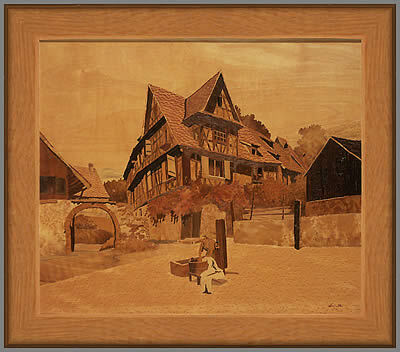 The "Spindler" Marquetry Company is a family firm that is located within the former Saint-Léonard Abbey located at the foot of the St. Odile mount in France. 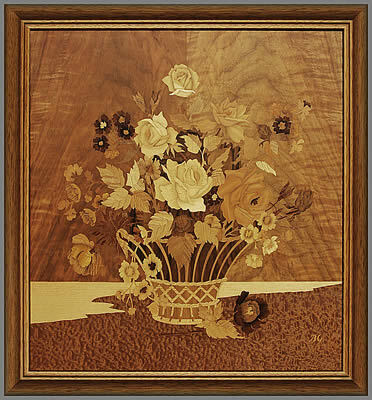 The company has been in existence for around a century and has produced some truly wonderful examples of the marquetry art during that time. Now, we come to a little bit of a conundrum, although we have a lot of knowledge and experience of the Buchschmid and Gretaux Wood Inlay Company, unfortunately we do not have an equal amount of similar information regarding the Spindler Company. We are indeed privileged to have Herr Otto Chlup as our advisor on all matters Buchschmid and Gretaux, but, as to the Spindler Company, we are afraid that we do not have a similar important authority with which to refer to. If any of you, our esteemed web site visitors, are able to supply us with knowledge of the collectability and perhaps the general popularity of these fine works, we would be much obliged to you. We have checked the current product catalogue, but, these designs are not listed. We wonder if these designs were the work of the founder of the Spindler Company, Charles, or his son Paul. 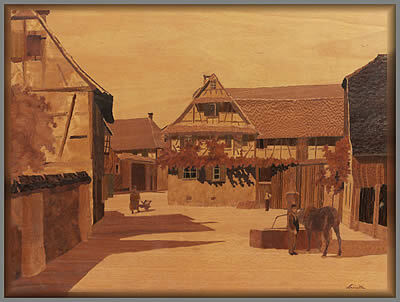 They created many Alsation scenes in marquetry, and they were both trained water colour artists. The subject matter of these pictures would certainly fit in with the presumption that either of those two members of the Spindler family had a hand in their design and construction, but without authorative knowledge on this particular company, we can only guide you with our own assumptions. We, at least, hope you find them helpful. As we said, if you can advise us with more accurate information, we will be more than obliged to you. Thanks for any input you can give us. 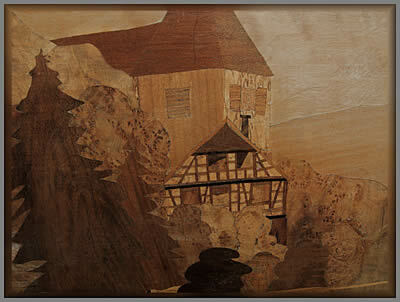 This German origin marquetry picture dates from the 1930 - 40's. 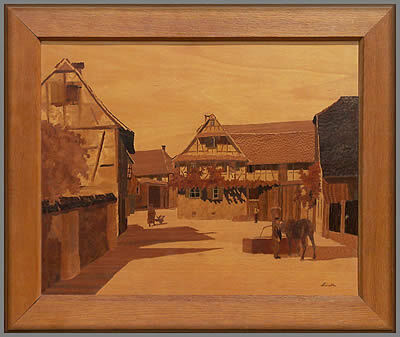 While on his tour of military duty in the mid 1940's Ron Stratton's father saw this picture in a German (art? we assume) shop, admired it and subsequently purchased it. Ron's father brought it back to the USA when he returned home and the picture has remained in the family ever since. Unfortunately not much is known about the artist or the origins of this picture. Ron has therefore asked us if we can help to provide the answers to those questions. Apparently there is some writing on the reverse of the picture. The text is as follows: "Walderichs Kirche Murrhardt". As far as we can tell, this text refers to Erich Wald who lived around 790 and was a Benedictine Abbot in Neustadt am Main. Walterich (Walderichs) Church was built at Murrhardt in 1225 and is still the prime goal for Catholic and Protestant pilgrims on Good Friday. Perhaps those references refer to the main theme of the picture, unfortunately this is only conjecture on our part, but it does give us a good clue as to where the location of this landscape may happen to be. Presumably the W. T. in the bottom right hand corner refers to the maker of this marquetry picture. If it follows current practice, it does. But, this was actually made roughly seventy years ago, so, would this assumption apply? A technical point to note here is that the W. T. has been cut in with a blade, not a saw. This probably means that this picture was cut by hand with a blade. The baseboard to this picture is a plywood construction. The picture measures 50 x 70 cms - or approx 18 x 24 inches. If anyone knows who made this picture and when, would they let us know so that we can advise Ron accordingly. Thanks for your help. Click the above button to return to page 21 of "Can You Help"
Click the above button to visit page 23 of "Can You Help"